When making Gabriel's Birthday Cake, I found myself with a bit of extra batter. What to do other than make cupcakes? The choice becomes exceptionally clear, especially when you are working with decadent Swiss Meringue Buttercream! 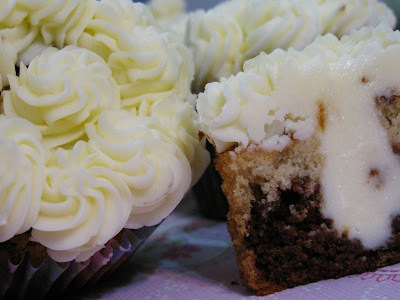 When it tastes this good, you want to make it last... by filling those cupcakes as well as frosting them! This is the easiest trick in the book! If your cakes are dense, take a potato peeler and poke the cupcake right in the center, and straight to the bottom - twist 360° to create a small hole. If your cakes are moist there is no need for this extra step. 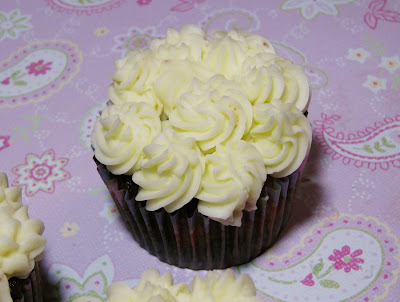 Press your piping tip where you created the gap in the center, and fill the cupcake with frosting! Frost as usual. that is a great tip! and those look amazing AS ALWAYS! You are sooooo talented! YUmmy!